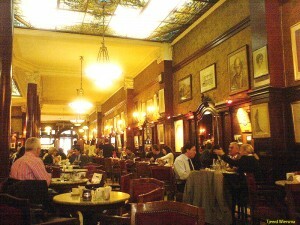 If you are only going to visit just one café in Buenos Aires, the Grand Café Tortoni would be a good choice. The quintessential Porteño café, located on Avenida de Mayo was founded in 1858 and has remained the meeting place for famous artists and scholars throughout its 154 years. High profile visitors include Albert Einstein, the King of Spain, Juan Carlos de Borbón, tango great Carlos Gardel and former U.S. Secretary of State and current Presidential Candidate, Hillary Clinton. The building itself is majestic, with intricate moldings, a $1.4 million Tiffany glass ceiling and like any classic Buenos Aires cafe, marble-topped tables. The waiters are top-notch, although they have a reputation of being gruff toward those whom they deem too casual for Tortoni standards — they let it be known that you’re at their mercy, at least, they certainly seem to have a presence that commands respect. In the salon downstairs there are interesting events, including live radio performances, poetry readings and the very popular tango shows. Be sure not to miss the historical photos that grace the walls and the backroom where you can play billiards, dice and dominoes. The café sits just a few blocks from the Plaza de Mayo with the Casa Rosada, City Hall and other important government buildings, so it’s a convenient spot to relax over a coffee if you’re doing some sightseeing. Due to its popularity you may want to avoid going to Tortoni during peak hours (generally after work during the week) — the place can get overrun by tourists and the acoustics can make it hard to hold a conversation. The food here is slightly overpriced standard café fare. It’s not recommended to eat a full meal here, just order a small snack — the a typical Argentine dessert with a café con leche or submarino with is a good bet. While here, take a worthwhile detour upstairs to the World Tango Museum to see the National Academy of Tango’s Belle Époque mansion and tango artifacts stretching back to the birth of the dance. → Visit Cafe Tortoni as part of the afternoon milonga tour.